Gourmand fragrances are any scents that are "foodie" in nature. These fragrances can smell like a decadent cupcake or a crisp fall apple. I have a great appreciation for a dark chocolate note and anything with gooey marshmallows. Coffee adds a great jolt to a fragrance dry down. Kilian's Love Don't Be Shy is a spongy, sweet confection of a fragrance. The inspiration is the marshmallow. Love Don't Be Shy is a bold sugary minx. My first impression was that it was a great homage to Guerlain. There is a heavy Shalimar influence. Love Don't Be Shy might be sweet but there is an undercurrent of mystery. There is a metallic honeyed Neroli note with a fairly grand Sambac Jasmine. There are appearances from Rose and Iris. The dry down is a great buttery vanilla with a cloud of musk. The sillage and lasting power is strong in this Kilian. The queen of all the gourmands is the legendary Thierry Mugler's Angel. It is chock full of sweetness. The gourmand notes are dark chocolate, caramel,coconut and cotton candy. I wore Angel throughout the 90's. It was an odd choice to pair with Doc Martens and vintage 1940's dresses. I loved its unique charm. I also loved that it was challenging to find in Ohio. I had to drive to Cleveland's Saks Fifth Avenue to purchase a bottle. Today you can find a bottle of Angel at your local Macys Department store and Wal-Mart. Angel has spawned many copies and tribute fragrances. It also inspires great love or hate among fragrance junkies. Angel will always have a special place in my heart. It was the fragrance that accompanied the best years of my life. Donna Karan has a series of fragrances that are inspired by the apple. All worthy and accurate. But the best apple fragrance is Molinard's Caramel Pain d'epice. It is all kinds of apple cider with a dollop of cinnamon. Gorgeous and perfect for the beginnings of fall. 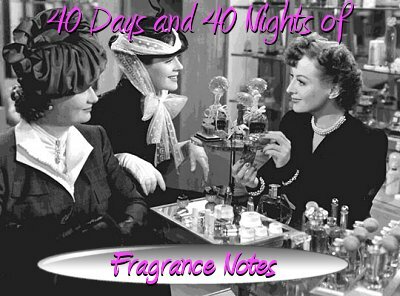 S-Perfume 100% Love: This is supposed to be a life changing gourmand. I have never smelled it! Escada Escada Collection: A great sweet but dark fragrance!Love and cherish my bottle. Let us know your favorite gourmand fragrances in the comments! Disclosure: All products mentioned in this review have been sniffed or purchased by the reviewer. I still find it so hard to believe that you wore Angel! It's so not like your perfume style now. My favorite apple scent is a bargain I discovered at TJMaxx, the cute Nelly Apple Bottoms! My favorite coffee scent is So New York by Bond No. 9, my first Bond and always dear to my heart. Ha ha ha! Annie, you got me hooked on Angel in college, too. I remember the hook was the chocolate and the star-shaped bottle. Now that it is everywhere, it has lost its powers over me. I adore Molinard Caramel pain d'epice thanks to you Annie! I wish we could come across some of it hmmm....maybe with a stash of Gobin Daude's to boot! I also really love Hermes Ambre narguile and Serge Lutens Five O'clock au gingembre. CDG Rhubarb, Jo Malone Blue agava and cacao and Guerlain SDV. Gourmand is a favorite scent category for me. I love this category! I confess to loving Pink Sugar and I don't care what that says about me! I used to like CSP Amour de Cacao but I haven't tried it lately. Annie, thank you so much for this series. I have enjoyed it so much! Will these reviews stay available in the archives? I want to be able to keep going back through them! I have to be in the mood for Gourmands, but when the mood strikes, nothing else will do! I just can't let this post go without a nod to my first (and cheapest) "foodie" fragrance: Love's Fresh Lemon. It made my mouth water! I miss it so. A second nod goes out to Dior for their Grape Soda inspired Poison fragrance. My favorite has got to be Lann-Ael by Lostmarch. It makes me think of pancakes and warm milk and fresh brioche with honey - all the things that are great about staying indoors when it's cold and dismal outside. Definitely a staple of mine in the Fall/Winter. ...and I also confess to having a bottle of Pink Sugar hidden in my linen closet.